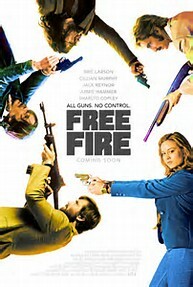 Free Fire tries to be a lot of things – from a 70s western, to a mafia stitch up – but namely it tries to be fun. When an arms deal in a warehouse goes terribly wrong, the transaction between the two gangs of criminals turns into a shootout for survival. An all-out shoot ‘em up movie that instead of a standard ten or even thirty-minute scene of bullets flying like crazy it lasts for the entire feature length. Try to imagine if Quentin Tarantino did a theatre play, and in fact this does have elements of Tarantino’s last feature The Hateful Eight, which is set around a dismal bar during a snow blizzard and has a stage-like quality to it. In Free Fire, the setting is similarly grounded, though in an abandoned umbrella factory that leads to some nice irony at the end. However, adding flashbacks and dialogue with meaning (rather than just for the odd laugh) would have helped give interest to the rather long-winded action. All the characters have potential and there’s a lot of great chemistry. Such as from the inordinately handsome Ord (Armie Hammer) and old-timer Frank (Michael Smiley) who have an odd banter throughout. A potential for romance comes in savvy IRA man with charm, Chris (Cillan Murphy) and the IFH (in it for herself) Justine (Brie Larson). The standout and who undoubtedly gets the most audience laughs comes from Vernon (Sharlto Copley). Even the characters in the movie watch him to be entertained, rolling their eyes and wondering, “Is everyone like you where you’re from?” Vernon is an arms dealer from South Africa and was mistaken for a genius as a child. It’s not a mistake that lasts him into adulthood. Fans of Better Call Saul will appreciate his wheeler-dealership style and there isn’t a scene that doesn’t benefit from having him there. Overall, the concept falls flat at the end and many plot points that feel important at the beginning, turn out to be just random, who knows/who cares, points as the story wraps up. The trailer for the film even edits the jokes deceptively better and really proves that you can have a great cast of characters, snappy dialogue, a cool style and lots of guns but a film needs drive. It’s a fun, likeable ride but like Ben Wheatley’s other movies (High-Rise, A Field in England etc. ), the execution doesn’t match it’s potential. Emma Watson is resourceful, fearless, emotional and ultimately very likeable for a new generation of girls to look up to.